The Rapidian’s crack team of expert food critics venture into the second day of tasting all 2015 Grandwich entries, with overall disappointment, a newfound fear of eggs and plenty of soapboxing. See Day One's assessment here. And the final day's review here. Then go out and try -and vote for- your own sandwiches with the help the Grandwich website. 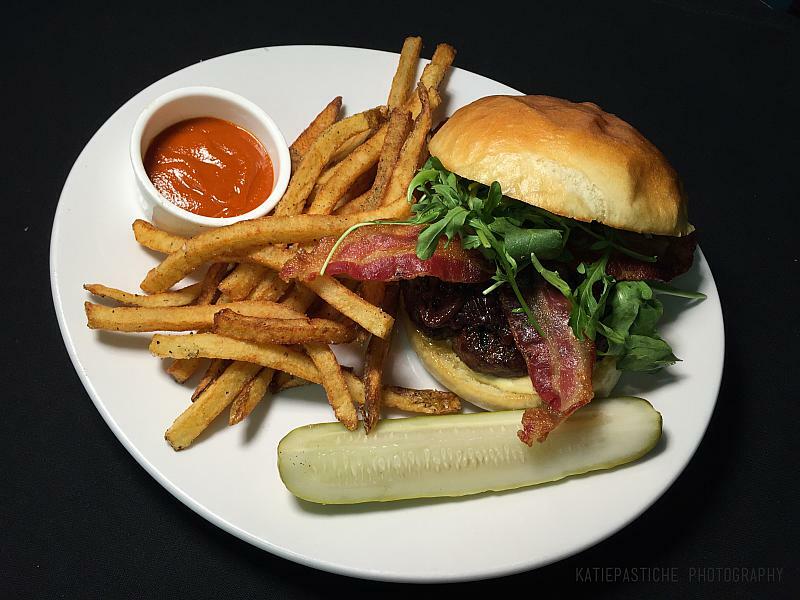 "Eight ounce house ground beef brisket burger served on a bakery bun with garlic aioli, red wine onion compote, arugula, and bacon slices. The burger comes with hand cut fries that are seasoned with salt, pepper, and our garlic herb seasoning as well as a side of house made catsup and a house made pickle spear." "Just like its namesake, The Peach Pit from Beverly Hills 90210, this Grandwich is where all the local cool kids hang out. The cast of characters: Roasted peach & GRBC stout BBQ pulled chicken with cucumber-jalapeno yogurt slaw, feta-chive spread and baby arugula on a pretzel hoagie bun. Served with hand-cut French fries lightly tossed in sea salt. Trust us. This sandwich is much better than our other idea, The Melrose Place." "It’s a double decker sourdough French toast sandwich, like the French Connection but more pork and less Gene Hackman. Here we go: Apple wood smoked bacon, Thinly sliced smoked ham, and grilled Polish sausage stacked on 3 pieces of cinnamon sourdough French toast with framboise-mascarpone cheese, dusted with powdered sugar and topped with a healthy dose of maple syrup (I said “healthy” to make myself feel better about it!) Served with Crack Fries. We can finally find out how Crack Fries & maple syrup taste together! Tastes like VICTORY!" "It starts with lightly toasted homemade multigrain bread by WRH bakery. Perfectly hard boiled eggs are mashed and mixed with mayo, spicy brown mustard, and celery. It is then topped with crispy Little Town Jerky Bacon and Bell's Two Hearted battered dill pickle all drenched under an over easy egg." "Just like the mix of cultures in Grand Rapids, gumbo represents a mix of cuisines. We take Andouille sausage from David Delski's Prime Meats, house blackened chicken with organic cheese from Grassfields Cheese on a baguette from Nantucket Baking Company smothered with seafood gumbo sauce featuring the holy trinity of celery, onions and bell peppers from the local farmers market. Served with a side of Cajun chips and Louisiana hot sauce." "Smoked turkey and Gouda complimented with a fresh slaw of apple, Ingraberg Farm’s rainbow radish & watercress tossed in orange honey vinaigrette. Finished with mango chipotle aioli on a locally-sourced artisan baguette. Served with zucchini fries and an extra side of chipotle aioli for dipping." "A special blend patty, truffle cheese, sautéed mushroom, arugula, horseradish mayo, fried egg on a toasted bloody mary bacon roll. Served with patties braves and harrissa aioli." "We’ve taken two of GR’s favorite things and combined them: Stella’s Rehab Brunch and Stella’s burgers. Imagine this behemoth: our house-made seasoned Black Angus 8oz burger, topped with a fried egg and our spicy-queso cheese sauce served between grilled cheese sandwiches made with cheddar cheese and a bacon-sourdough bread from Nantucket Bakery with lettuce, tomato, onion and sliced dill pickle. Secret ingredient that ties it all together…strawberry jam! Served with a side of Chronic Fries. Don’t worry about people seeing you eat this monstrosity. What Happens At Stella’s, Stays At Stella’s." "Roasted Duck, Smoked Pulled Pork, Gorgonzola Crumbles, Caribbean Slaw, Perrin Grapefruit IPA Infused Greek Yogurt on Toasted Jalapeño Cheddar Focaccia"
When we began today’s Grandwich review we had no idea the Dante-esque journey upon which we were about to embark. Fortunately for us critics, there was a single beacon of hope for the future of sandwiches as a whole, because without that one shining light the other offerings whose ratings ranged from “meh” to “culinary hate-crime” could have convinced me and several of the other judges to never eat another sandwich again, and possibly expatriate to a distant island in the South Pacific where the natives don’t know what a sandwich is. In a word, day two of tasting was rough. I’d send a special “thank you” to Bar Divani for giving us the only sandwich of the day that was a decisive win, and something all the judges (Chef Emily Savageau, Media guru Steve Zaagman, Editor-in-chief Holly Bechiri, and me, Chef Torrence O’Haire) were excited to return to Bar Divani and enjoy again. A house-ground brisket burger with caramelized onions, arugula, and garlic aioli with unabashedly peppery fries, this was the only sandwich of the day we loved, as we agreed it “tasted like real food.” It wasn’t necessarily the most creative option, as the Divani Burger is a regular part of their menu, but it was just so well-made it was a hands-down win. The Divani Burger is proof that a well-made classic will always beat wanton, misdirected creativity. Grand Rapids Brewing Company was a distant second place, but personally my biggest disappointment of the day. Like that brilliant 10th-grader who just refuses to do his homework, the GRBC sandwich sounded delicious. It could have been great. I wanted it to be great. Sadly, it just didn’t apply itself. The flavors sound dynamic and interesting, but were remarkably unclear. We found ourselves asking how a pulled-chicken sandwich consisting of roasted peach, stout, feta, jalapeno, and cucumber manage to not taste at all like roasted peach, stout, feta, jalapeno or cucumber. Try harder, and see me after class. McFadden’s Cajun-style sandwich was a split-vote, with two of our judges liking the spicy andouille sausage, and the other two agreeing that the gristly chicken overpowered the sandwich with a “generic Cajun seasoning” flavor. We all agreed it wasn’t great. Beyond those three, my ability to be a responsible journalist is staunchly tested. Stella’s bizarrely overwrought “pile of food” -a burger with a grilled cheese sandwich on each side in place of a bun- must have been dreamed up in some marijuana-crazed fantasy and brought into campy real life as a “generic-Stella’s-seasoned” Dali-esque mess that aims for points solely on comedic effect than on taste. Peppino's entry was a squishy grocery store lunchmeat sandwich that we agreed would be more apropos on the late-night buffet at a Campus Dining location. A fancy-sounding name couldn’t save Rockwell/Republic’s “Truffle Burger” from cheap-tasting beef, squishy mushrooms, a brutally undercooked fried egg and an overall flavor of grease. Hopcat joined Stella’s in the “garishly goofy pile of food” category with bacon, ham and Polish sausage layered between three slices of french toast. All of it was was flavorless, unless you consider “sugar” a flavor. If so, it was full of “flavor.” So much “flavor” the doctor might have to take my foot. At the center of the rings of our “Dante’s Inferno” of sandwiches sits J. Gardella’s egg salad offering. This was bad. This was such a disaster, the Red Cross screened its phone calls. How can an egg salad sandwich made with so much celery the egg salad is a disconcerting green not actually taste at all like celery? Or frankly, anything? If this sandwich was some sort of Dadaist post-modern sociopolitical statement, I’d give it at least some credit. Otherwise, it was simply so, so bad. You may think I’m being harsh in my criticism of these offerings. I will offer some allowance for the fact that we ate these sandwiches all as “carry out”, which often lowers the quality of the food a bit. As a chef, I’ll also allow that the best chef can come up with an amazing recipe, but if some careless line cook slaps the ingredients together haphazardly, it’s not the chef’s fault that the dish is terrible. But so far we’ve had 17 sandwiches offered as entries to a regional “best sandwich” competition, and our group only found about four of them enjoyable: for that, I’m taking a soapbox moment. Restaurants of Grand Rapids: it’s time to stop thinking your guests are idiots. Yes, for a long time Grand Rapids wasn’t what you’d call a “mecca of culture.” But as our city grows and our citizens expand and develop and learn, you, restaurants, have to start helping us expand and develop. Stop trying to sell us cheap, low-quality ingredients through the trickery of fancy words that you’re using wrong (e.g. you can’t infuse beer into yogurt. You stir it in. That’s not an infusion. ), or by giving us such hilariously exorbitant quantities that you think we’ll be too busy “oohing” and “aahing” to notice that your food is of poor quality and poorly made. Stop sacrificing skill in the kitchen and legitimate creativity for buzzwords and random trend-surfing, and stop letting your staff sell food that you wouldn’t be directly proud to both eat and serve yourself. Train your kitchen staff to be more thoughtful in their work and put out food that garners respect, as opposed to working as fast and cheaply as possible. There’s no wonder that our only favorite out of 17 sandwiches so far was one of the less creative, as it was pulled from the year-round menu, but one of the only ones made with quality ingredients in a balanced, thoughtful manner. Should it win a sandwich competition in any other Bon Appetit-level “food city?” Not really. Should it leave all the other 16 sandwiches in the dust in this competition? Absolutely. It’s time we recognize that the only reason that Grand Rapids isn’t on the cover of Food and Wine magazine as one of the next “food scenes to explore” is that too many of our restaurants still think they can sell us “C+” dishes at “discount prices” and win contests, and too many of us Grand Rapidians let them. Just because something is “huge” or “weird” or covered in cheese does not mean it’s good, and the phrase “it’s good, for Grand Rapids” should be a dire insult. Make us food that’s on caliber for everywhere, and we won’t feel like we need to take a weekend in Chicago to get a decent meal or drink. Don’t get me wrong. We, the people of GR, are rooting for you restaurants. And some of you are doing excellent work and we absolutely applaud that. Look, we want you to succeed. But the rest of you need to stop messing around and do a better job. Or we’re just going to start making our own sandwiches.